Ahhh summer. Sunny days, warm nights, and most importantly – it’s grilling season! 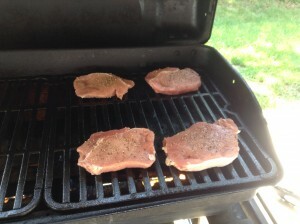 Cooking on the grill is great for people who hate cleaning up the kitchen – like me! You can cook almost anything on the grill – including cakes and muffins, but I’m not that advanced yet. 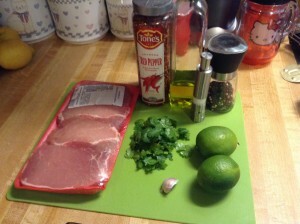 Today’s recipe is cheap, quick, and delicious: Cilantro Lime Pork Chops! Let’s get to it! First, gather your ingredients: pork chops, limes, garlic, cilantro, olive oil, red pepper flakes, salt, and pepper. 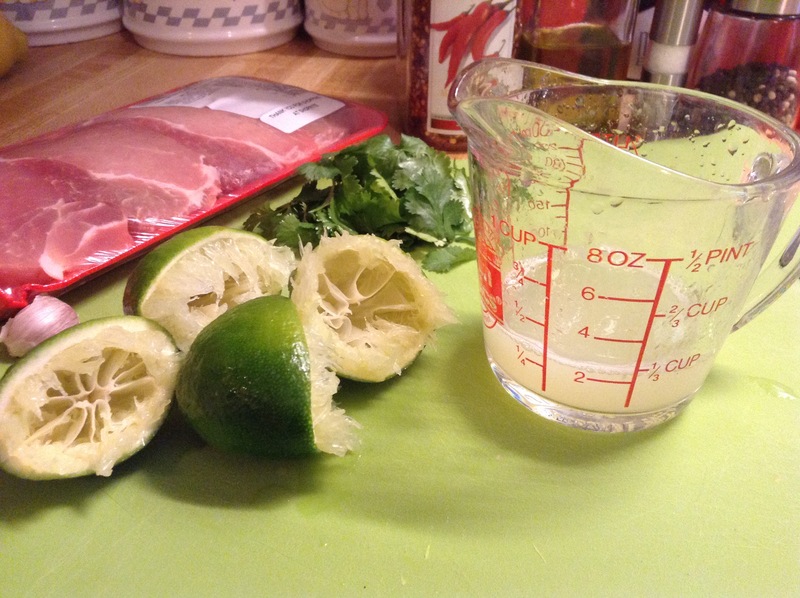 Prep your ingredients by chopping the cilantro, mincing the garlic, and halving the limes. 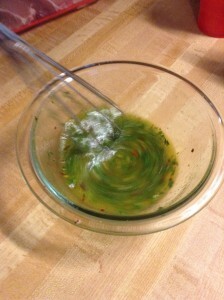 To begin the vinaigrette, squeeze the juice from your limes – it should equal about 1/4 cup. Tough time getting the juice out? Pop the whole limes into the microwave for about 8-10 seconds, slice, and squeeze away. BONUS: This would make a great salad dressing. Add in some Dijon mustard and/or honey and you’re good to go! 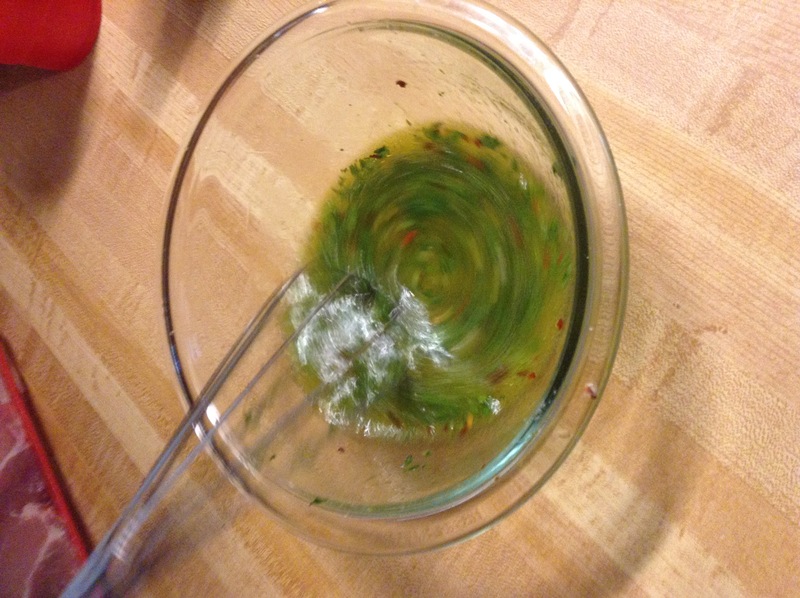 Add the lime juice to a bowl and whisk in the minced garlic, salt, and red pepper flakes. 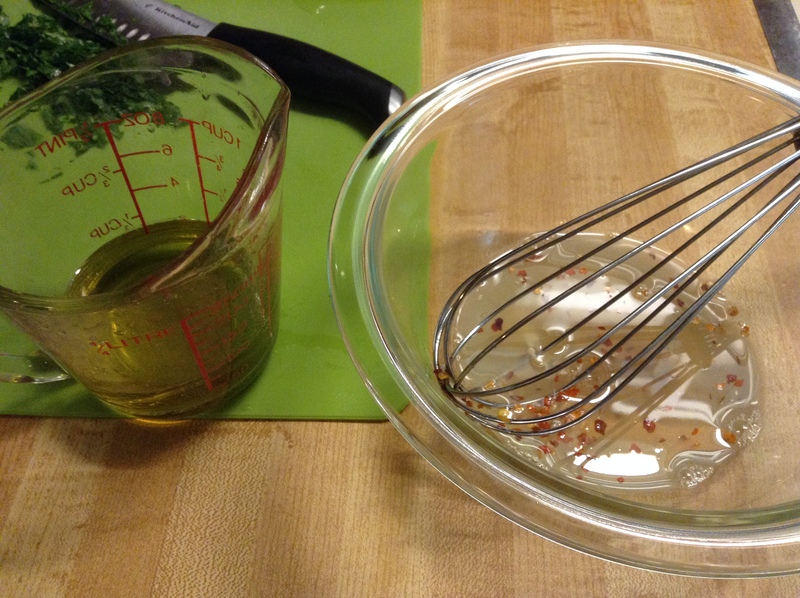 Once you’ve finished your vinaigrette, set aside. 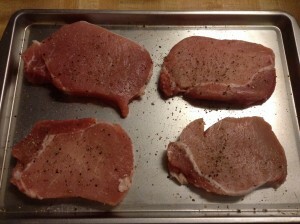 Open the pork chops, pat dry with a paper towel, and season each side with salt and pepper. Light up the grill on medium-high heat. I’m cooking with a gas grill, so adjust these instructions from here based on the type of grill you’re using. 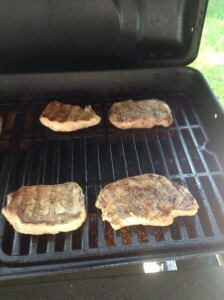 I don’t have much experience with wood or coal grills, so gas is my forte. Additionally, my grill is a little temperamental and sometimes likes to burst into flames. Safe flames of course. Safe-ish flames. I can’t explain it. So medium for me is like a controlled burn, whereas high is more of a smoldering inferno. Just use your judgement. 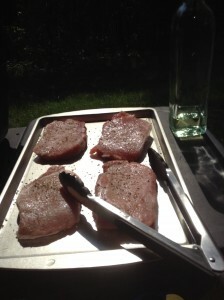 Stick your lovely seasoned chops on the grill, close the lid, and walk away. I find that a grill is like a kettle – a watched kettle never boils. However, an ignored grill almost always burns. 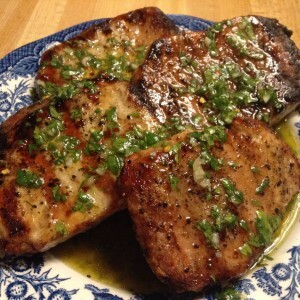 So don’t go too far, but let the chops cook for 4-8 minutes depending on the thickness. 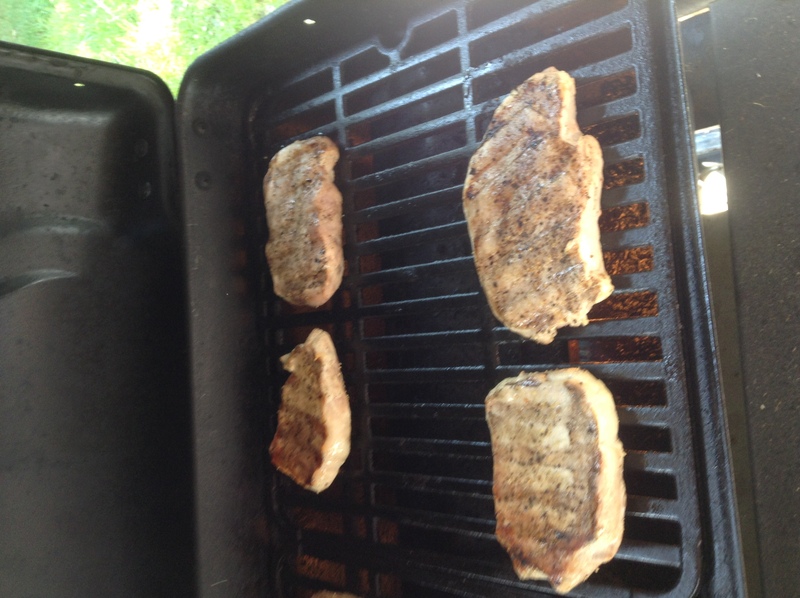 I had medium, center cut chops so 5 minutes was sufficient. Turn the chops and let cook for another 4-8 minutes. If you don’t cook pork much, you need to know that it cannot be served under or you’ll get a tape-worm and end up on the Monsters Inside Me. Kidding, you’ll just get worms. Really. Don’t do it. No one wants worms. Serve the chops with the vinaigrette drizzled over the top. Reserve some extra vinaigrette if any of your eaters are into dipping. Enjoy! Begin by prepping your ingredients: mince the garlic, chop the cilantro, and juice the limes. 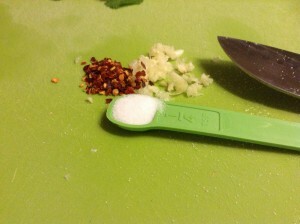 Add lime juice, garlic, salt, and red pepper flakes to a bowl. Whisk to combine. 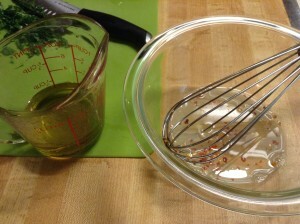 Slowly whisk in the olive oil until completely combined. Set aside. 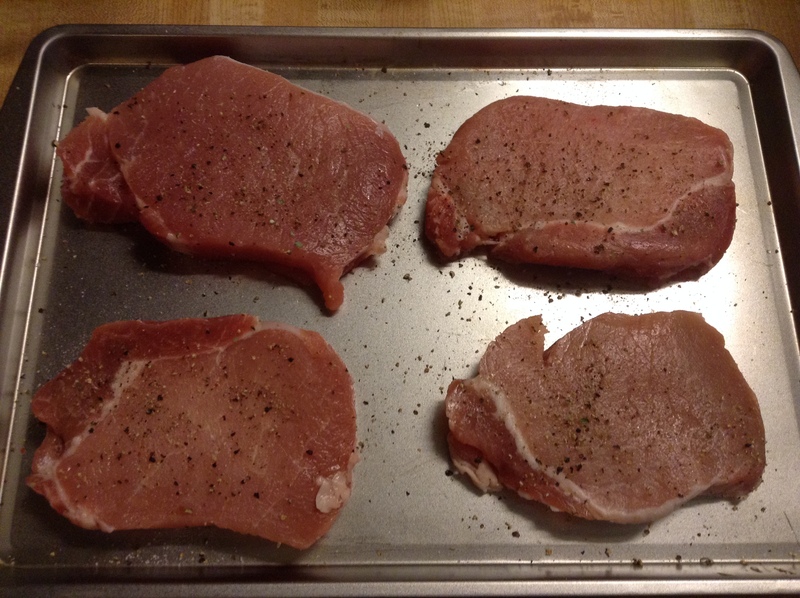 Pat pork chops dry with a paper towel and season both sides with salt and pepper. 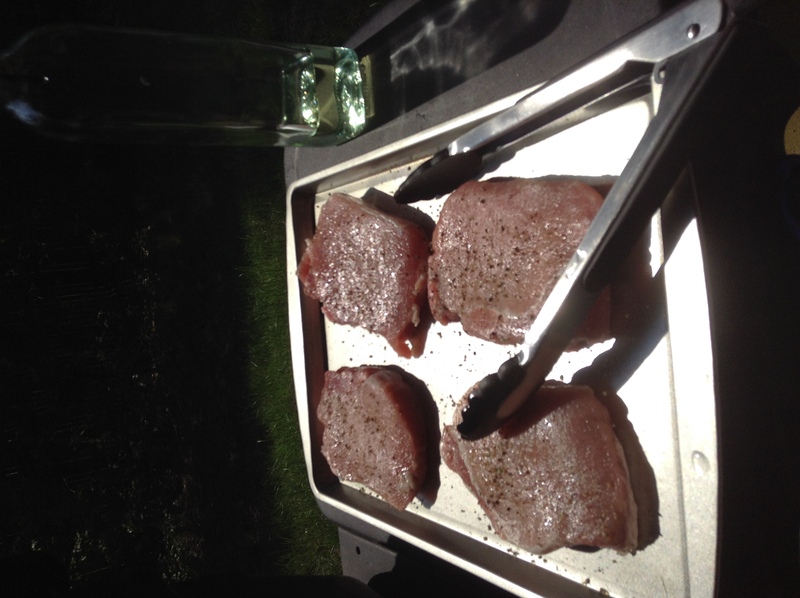 Warm the grill to medium/high heat and cook the pork for 4-8 minutes per side, depending on the thickness of your cut. 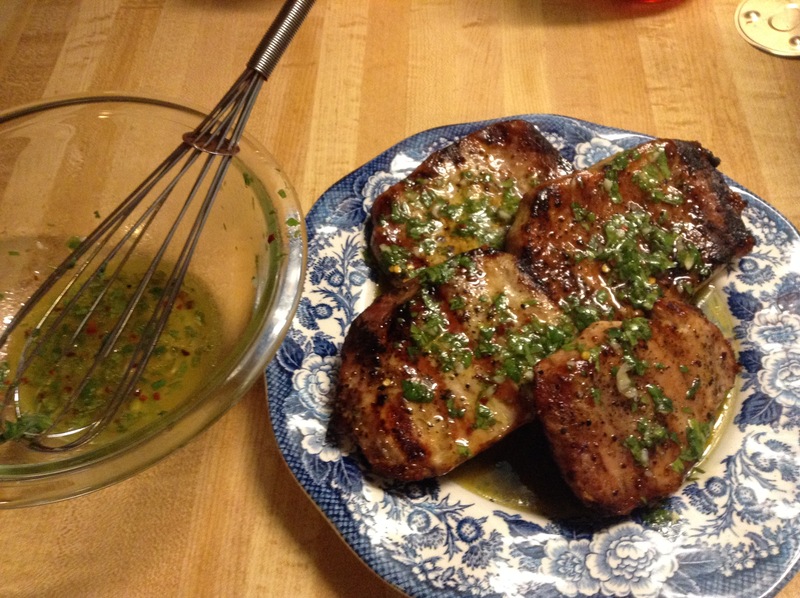 Pour vinaigrette over pork chops and reserve some of the mixture for dipping.